Birsa Munda, one of the reconverted, claimed that they were lured towards Christianity but later treated badly by those who had convinced them to convert. Pic. PTI. Hindu Jagran Manch returned 98 Christians belonging to 23 tribal families to their original Hindu faith in Tripura. 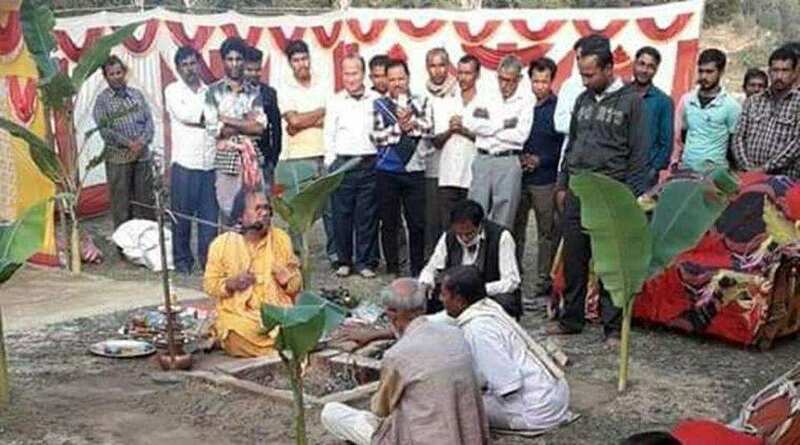 PTI | Kailashahar (Tripura) | Jan 22, 2019:: The Hindu Jagran Manch, a Hindu right-wing group, claimed that 98 Christians belonging to 23 tribal families were “reconverted” to Hinduism in Tripura. “We are very poor people. Christians converted us. They also frequently misbehaved with us. We reconverted to Hinduism by our own will,” he told reporters. This entry was posted on January 23, 2019 by hinduexistence in Anti-Hindu, Attack upon Hindus by Christians, Breaking India by Christian, Christian Conspiracy against Hindus, Christian Conversion Conspiracy, Christian Conversion Conspiracy against Hindus, Conspiracy against Hindus, Hindu Religious Issues, Re-conversion - Paravartan, Return to Hindu Root, Save Hindus in North East India, Save India from Christian Menace and tagged 98 tribal Christians returned to Hinduism, Christian Conversion Problem in North East, Ghar Wapsi, Hindu Jagran Manch, Vishwa Hindu Parishad (VHP).